Traffic engineers have come up with a low-cost way to avoid deadly accidents with commuter trains that can speed through on an express run. At Ravenswood Avenue in Menlo Park, cars get backed up onto the tracks waiting to turn. It is an area that saw a deadly accident in February. A six-month program launched this week to keep the flow of traffic going straight in the area and keep cars from backing up onto tracks and into the path of oncoming trains. 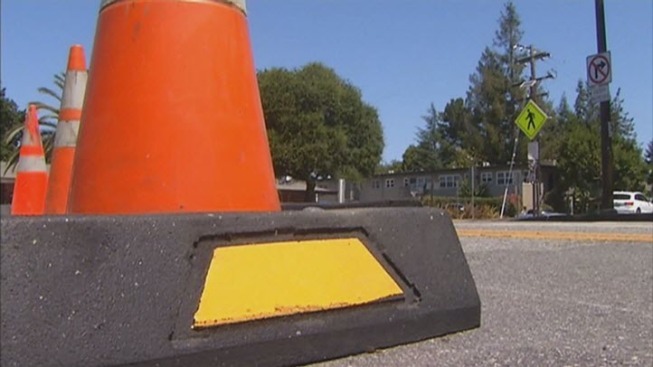 Traffic engineers are testing to determine if temporary curbs, cones and signs can keep drivers safer. Officials said the goal is to avoid devastating accidents like the crash in February that resulted in the death of 35-year-old Jahyun Koo after her car was hit by a train. Tracks reopened Tuesday morning after the driver of an SUV died after being struck by a Caltrain train in Menlo Park on Monday. Michelle Roberts reports. Menlo Park Councilman Ray Mueller said the program is just the beginning, adding that a better solution is a bridge or a tunnel. "We want the grade separation to happen, we need that to happen," Mueller said. Mueller said the project could take a long time and cost $100 million, far more than orange cones and temporary curbs. Menlo Park is also in discussions to get the traffic light on El Camino Real synchronized with approaching trains.